A traditional Thai dish prepared in under 20 minutes. Thank you, DuoDishes.com! In a wide skillet or wok, heat the vegetable oil and sesame oil over medium high heat. Once hot, add the onions and cook for 8-10 minutes, or until they start to brown. Add garlic and chilies, stirring to coat in the oil. Pour in the vinegar, sweet chili sauce, shrimp paste, lime zest and juice and fish sauce. Reduce heat to medium low and cook for 3-5 minutes. 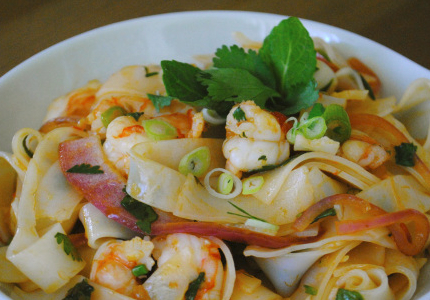 Add shrimp and toss in sauce, followed by noodles. Cook for 2-3 minutes, then stir in scallions, mint and cilantro. Serve immediately.